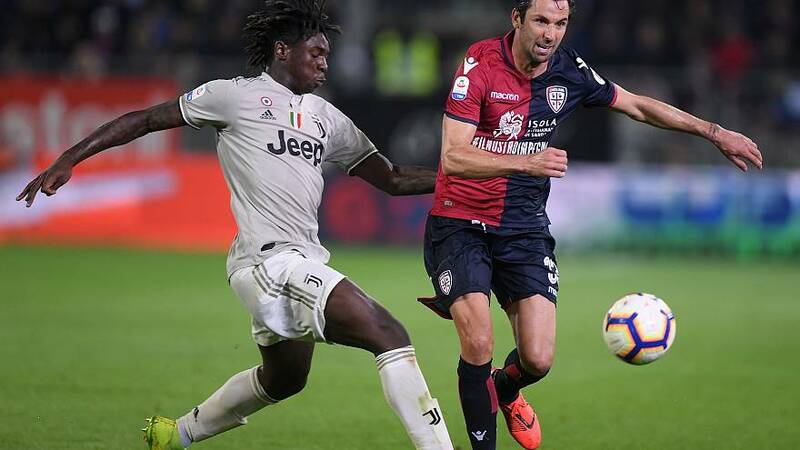 Juventus teenage striker Moise Kean suffered racist abuse from fans after helping his side to a 2-0 victory over Cagliari in the Serie A match on Tuesday. Kean scored the winner with five minutes left on the clock and celebrated with his arms open, in response to chants aimed at him throughout the game. He was then subjected to monkey noises from Cagliari fans. Shortly after the goal, Juve's French midfielder Blaise Matuidi appeared to threaten to walk off in a bid to protest against the abuse his teammate faced. Matuidi complained last year that he was subject to racist abuse at the same stadium and Cagliari later apologised. Play was halted on Tuesday and a warning was broadcast to the crowd - the first step in the so-called three-step procedure which ultimately leads to the teams being led off the field. Play resumed amid more booing and the referee blew the final whistle shortly afterwards. Juventus defender Leonardo Bonucci, scorer of the opening goal in the 22nd minute, accused Kean of being partly to blame for the incident. "You celebrate goals with your teammates," he said. "He could have done it differently... I think the blame is fifty-fifty. Moise should not have done that and the Curva should not have reacted in that way." Bonucci has since took to Instagram to clarify his comments, saying he had been "misunderstood". "Yesterday I was interviewed right at the end of the game, and my words have been clearly misunderstood, probably because I was too hasty in the way I expressed my thoughts." "Hours and years wouldn't be enough to talk about this topic," he added. Juventus boss Massimiliano Allegri shared the same view, saying the 19-year-old should take a share of the blame. "He shouldn't have celebrated in that manner," said Allegri. He added that "uncivilised” fans “must be identified with the cameras” and barred from entering stadiums. Cagliari president Tommaso Giulini blamed Kean for his celebration. Juventus declined to add additional comment on the incident. The incident shines a spotlight on the blight of racist incidents to have marred Italian football matches in recent months. In December, Inter Milan were ordered to play two home games behind closed doors after Napoli defender Kalidou Koulibaly was racially insulted during a game at the San Siro. In 2017, there was an outcry after Ghanaian player Sulley Muntari was booked and sent off after complaining about racist abuse while playing for Pescara, also at Cagliari. The rise of racist incidents has been seen across European football, including England’s Premier League. England forward Raheem Sterling called for football authorities to do more to stamp out racism in football grounds, including possible stadium bans for whole sets of supporters. "It's now time for the people that are in charge to put a real stamp on it because you can fine someone but what's that going to do?”, Sterling told Sky Sports after receiving abuse in a Euro 2020 qualifier for England vs Montenegro on March 25. “You’ve got to punish whole fans that can’t come to the game, you’ve got to do something to really make them think twice. If teams can’t play with their fans it’ll be difficult for them”. Sterling cupped his ears in celebration after scoring a goal against Montenegro. The Manchester City forward was also on the back of racist abuse from Chelsea supporters in a Premier League game in London against Chelsea back in December. Other high profile incidents in recent months include Liverpool’s Mo Salah, who suffered Islamophobic abuse in an English Premier League match in February.